When it comes to soap operas, Kyunki Saas Bhi Kabhi Bahu Thi is definitely known and remembered as one of the best. The series was long-running and memorable indeed. The very same serial has now completed 18 years since production. It was the very famous serial and broke many records. Characters from the serial are still evergreen and vivid in our minds, including Jodi or Tulsi. And after over a decade and a half, actors cherished their memories on social media. This is what Smriti Irani shared at social media. On Instagram, the star actress who played Tulsi, Smriti Irani posted a picture from the sets. In the photo, she is seen with co-star Amar Upadhyaya. Amar was one of the first actors to play the role of character Mihir. The actors who played this role kept changing over time. This caught Ekta Kapoor’s attention and their adorable banter was witnessed as well. 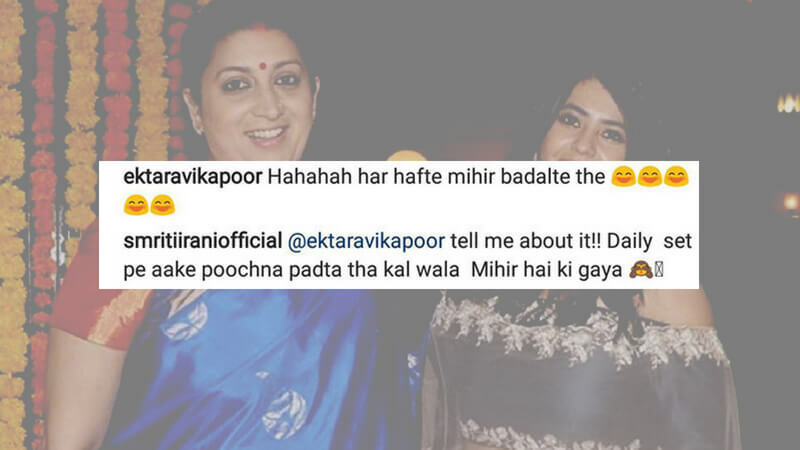 Ekta Kapoor herself admitted to the Mihir-changing every week! Furthermore, In response, Smriti says, every time she was in the set, she had to ask if the same Mihir was onboard! In addition, Ekta Kapoor trolled herself by saying that one of the lead actors in her own serials kept changing! And that, on a weekly basis as well!